Tojo Castle (東條城) is a mountain castle located in Aichi Prefecture. It was built in early 13th century by Kira Yoshikage. In 1222, Ashikaga Yoshiuji became the Syugo Daimyo of Mikawa, and he gave his son Yoshitsugu the land of Tojo. Until the fall of Ashikaga clan in Sengoku period, Tojo became important for the government of Mikawa. 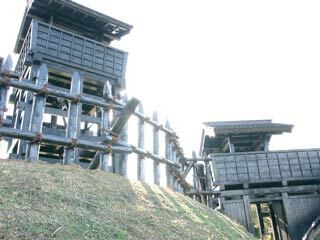 Today, The gate and keep are reconstructed which give the look of classic mountain castle. Castle was built when Kira Yoshitsugu became the lord of Tojo land in 13th century. 12th lord Kira Mochihiro married the sister of Matsudaira Kiyoyasu, the grandfather of Tokugawa Ieyasu. When Kiyoyasu was killed, he saved his son (Senchiyo, the father of Ieyasu) and raised him until he became adult. After the battle of Okehazama, Ieyasu made alliance with Nobunaga and defeated Tojo castle. However, when Ieyasu unified Japan, he found descendant of Kira Mochihiro and hired him as Hatamoto. Tojo Castle was governed by Matsudaira clan, after Ieyasu defeated this castle, and kept until 1607. Then, it was destroyed.